For the past decade} mathematician Dan Lynch has trained his computer models on a swirling enigma in the North Atlantic. 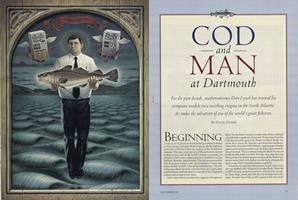 At stake: the salvation of one of the world's greatfisheries. 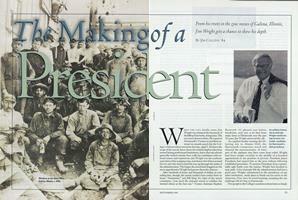 From his roots in the zinc mines of Galena, Illinois, Jim Wright gets a chance to show his depth. 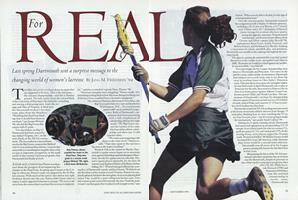 Last spring Dartmouth sent a surprise message to the changing world of women's lacrosse. On the first coeducational freshman trip, a woman danced a Tennessee two-step into a Green institution. Why animal rights rhetoric may be wrong.